Great prices on brand name throwing knives, throwing knife sets, and throwing knife targets. Also carry throwing axes, spears, and knife sharpeners. Overall: 6.875"; Blade: 3.25" | Standard Edge; Other Info: Dual lanyard holes. One piece black titanium coated 8Cr13MoV stainless construction. Double-edged blade. Black molded sheath with lanyard. Boxed. Made in China. 8 1/2" overall. 3 3/4" double edge blade with black trim. One piece stainless construction with machined slot and hole cutouts. 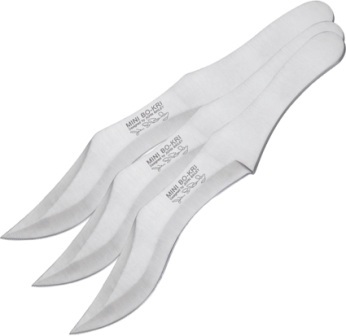 Black nylon belt sheath holds all three knives. Made in China. 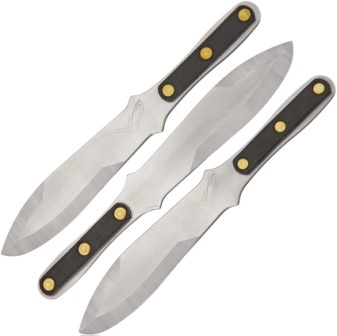 Includes three 7 1/2" overall throwing knives with 3 1/8" blades. One piece stainless construction with drilled hole design on handle and diamond shaped cutouts. Black nylon belt sheath holds all. Made in China. 12" overall. 6.38" stainless clip point blade. Black paracord wrapped handle. Glass breaker. Lanyard hole. Boxed. Made in China. 10.25" overall. 6" double edge 420 stainless blade. Black stainless handle. Set of three. Black leather belt sheath. Boxed. Made in China. 10.75" overall. 6.63" blade. 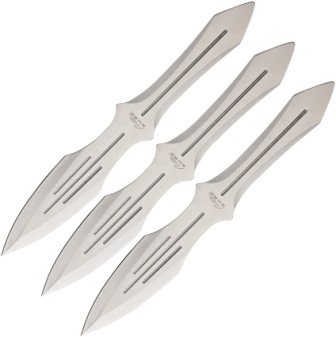 Includes three Mini BO-KRI throwing knives. One-piece 420J2 stainless construction. Brown leather belt sheath. Designed by John Bailey. Boxed. Made in China. 13.25" overall. 7.13" blade. Full tang. Weighs 14 oz. One piece 420J2 stainless construction. Brown leather belt sheath. Designed by John Bailey. Boxed. Made in China. 13.25" overall. 7.13" blade. Includes three knives. One piece 420J2 stainless construction. Brown leather belt sheath. Boxed. Made in China. 8.88" overall. 5.5" double edge blade. One piece 420J2 stainless construction. Black leather belt sheath. Boxed. Made in China. 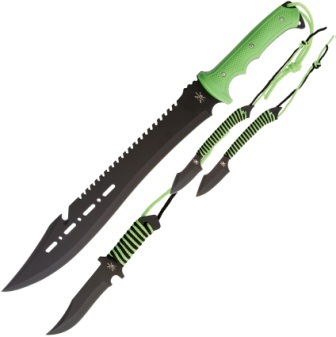 Set includes the Ziel which is 13.25" overall with 7.13" blade and the M-Ziel which is 8.88" overall with 5.5" blade. One piece 3Cr13 stainless construction. Brown leather belt sheath. Boxed. Made in China. 8 1/2" overall. 4" double edge blade. One-piece black and satin finish 440 stainless construction. Skeletonized handle. Three piece set. Black nylon belt sheath. Made in China. 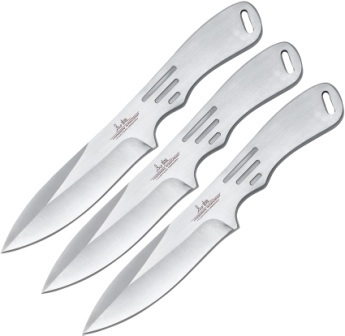 Overall: 10"; Blade: 5.25" | 420HC Stainless | Standard Edge | Brushed Finish; Handle: Stainless; Other Info: Three piece set. Dual edged blade. One piece construction. Black leather belt sheath holds all. Boxed. Made in the USA. 9" overall. 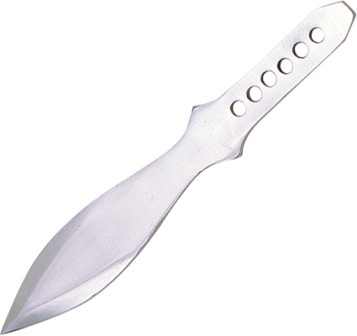 4.5" satin finish double edge dagger blade. Lanyard hole. Two pieces. One piece stainless construction. Black nylon belt sheath. Boxed. Made in China. 9" overall. 5" blade. Lanyard hole. Two pieces. One piece stainless construction. Black nylon belt sheath. Boxed. Made in China. 8 5/8" overall. One piece stainless construction. 4 1/4" stainless double edge blade. Handle features machined hole cutouts. Black leatherette belt sheath. Made in China. 9 3/4" overall. 6" 420 stainless double edge blade. Textured black composition handle. Lanyard hole. Black nylon belt sheath. Made in China. 12 Piece Set. Knives are 6" overall. 3 1/2" double edge blade. One piece stainless construction with two tone black and satin finish. Skeletonized handle. Black nylon storage roll with Velcro closure and belt loop. Made in China. 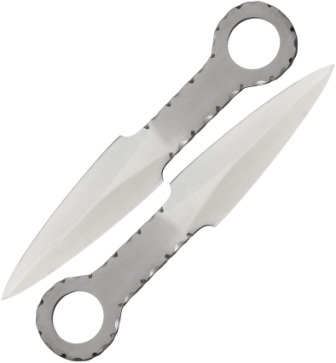 Features 7 7/8" overall throwing knives with 4" double edged blades. One piece black coated stainless construction with two toned black and silver blades. Slot cutout design handle. Black nylon belt sheath holds all knives. Double Thrower Set. 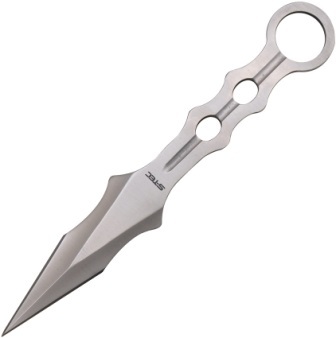 Includes two throwing knives. Made in China. 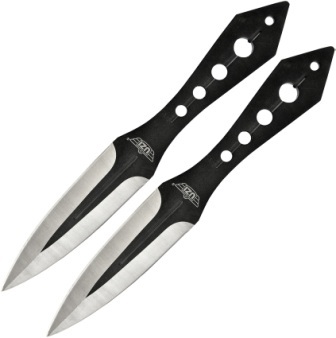 Features 7 7/8" overall throwing knives with 4" double edged blades. One piece black coated stainless construction with two toned black and silver blades. Slot cutout design handle. Black nylon belt sheath holds all knives. Triple Thrower Set. 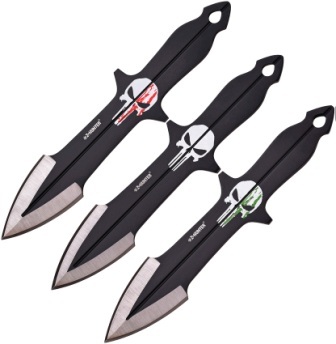 Includes three throwing knives. Made in China. 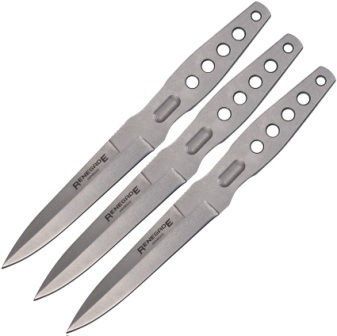 Includes three 8 1/2" overall all stainless throwing knives with 4 1/2" blade. Lanyard hole. Black nylon belt sheath. Made in China. Three Piece Set. Knives are 10" overall with 2" sharpened double edge tip. One piece stainless construction. Black nylon belt sheath holds all three. Made in China. Overall: 10"; Blade: 3.5" Standard Edge; Other Info: One piece black finish stainless construction. Double edge blade. Black nylon belt sheath holds all. Boxed. Made in China. 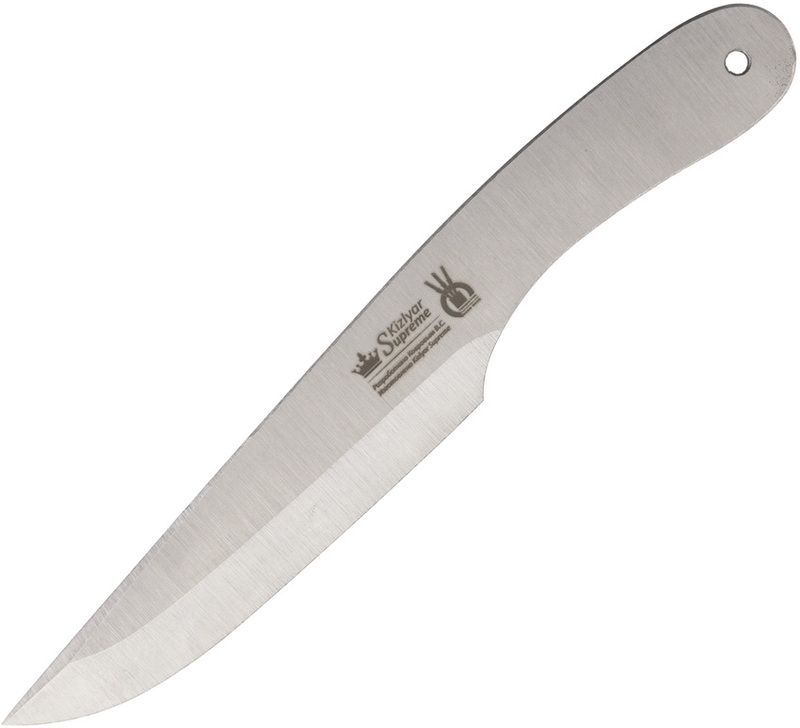 Overall: 10"; Blade: 3.375" - Stainless - Standard Edge - Satin Finish; Other Info: Full Tang. One piece stainless construction with grooved design. Double edged blade. Contoured handle. Black nylon belt sheath holds all. Boxed. Made in China. Overall: 8.375"; Blade: 4" l Stainless l Standard Edge l Black Finish; Handle: Stainless; Other Info: Set of two. One piece construction. Black nylon belt sheath holds both. Hang Packaged. Made in China. 6 1/2" overall. 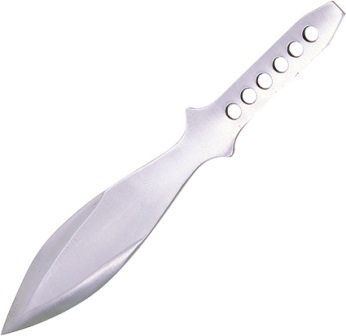 2 1/2" AUS-8A high satin polished stainless double edged dagger style blade. Full tang. Black long Kray-Ex handle with stainless finger guards. Lanyard hole. 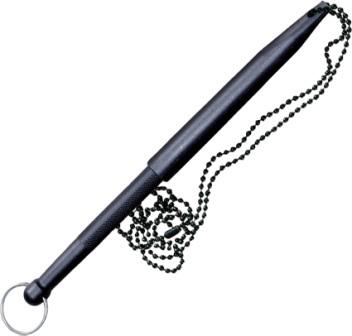 Black molded Secure-Ex sheath with black bead chain lanyard. Made in Taiwan. 16" overall. 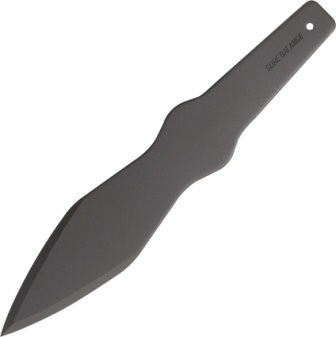 9 3/4" black finish SK-5 carbon steel wide-design double edge blade. Full, extended tang with ring pommel. Removable black high impact polypropylene handles. Black Secure-Ex belt sheath. Made in Taiwan. Overall: 10"; Blade: 2.5" | Carbon Steel | Standard Edge | Black Finish; Handle: Black | Carbon Steel; Other Info: Lanyard Hole. One-piece black finish 1055 carbon steel construction with sharpened double tip. Hang Packaged. Made in South Africa. 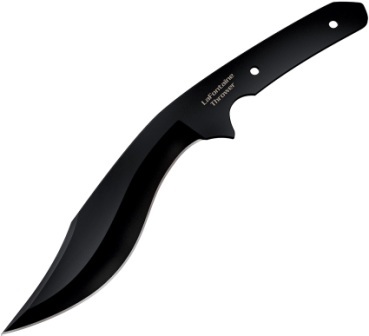 Overall: 12"; Blade: 2.5" | Carbon Steel | Standard Edge | Black Finish; Handle: Black | Carbon Steel; Other Info: Lanyard Hole. One piece black finish 1055 carbon steel construction with sharpened double edge tip. Hang Packaged. Made in South Africa. Overall: 13.25"; Blade: 4.5" | Carbon Steel | Standard Edge | Black Finish; Handle: Black | Carbon Steel; Other Info: Lanyard Hole. One piece black finish 1055 carbon steel construction with sharpened double edge tip. Hang Packaged. Made in South Africa. 13 1/2" overall throwing knife. One piece black finish 1055 carbon steel construction with 6" sharpened edge. Black polypropylene handles. Bulk packed. Made in China. One-piece black finish 1055 carbon steel construction. 13" overall. 3 1/2" sharpened double edge tip. Black finish metal handles. Bulk packed. Made in China. 12" overall. 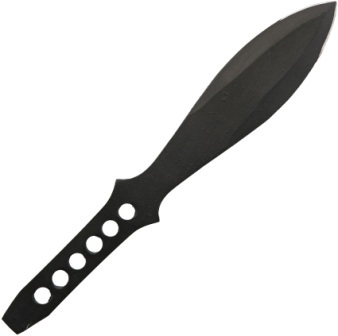 6.75" black finish 1055HC steel blade. OD green cord wrapped handle. Black Cor-Ex belt sheath. Made in China. 14" overall. 8.25" black powder coated carbon steel blade. Black carbon steel handle. One piece S50C carbon steel construction. Black nylon belt sheath. Boxed. Made in Taiwan. 14" overall. 8 1/4" Roman point blade. One-piece tempered black finish S50C stainless construction. Handle has machined hole cut outs and finger grooves and can be paracord wrapped. Lanyard hole. Black nylon sheath. Made in Taiwan. Overall: 14"; Blade: 7.5" | 1050 Carbon Steel | Standard Edge | Black Finish; Other Info: Lanyard Hole. One piece construction. Black baked-on protective coating. Hang packaged. Made in China. Overall: 8"; Blade: 6" | Carbon Steel | Standard Edge | Black Finish; Other Info: One piece construction. Black baked-on protective coating. Hang packaged. Made in China. 13 1/2" overall. 9" blade. One piece black finish 1055 carbon steel construction. Black composite onlay handles. Sheath available separately. Made in Taiwan. 13 3/8" overall. 9" 1055 carbon steel blade. One piece construction with a black weather resistant finish. 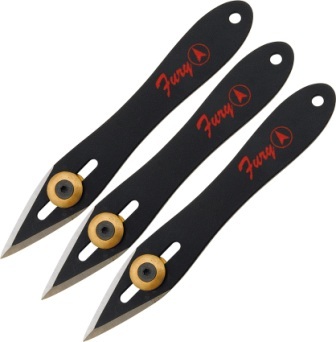 Black replaceable composite handle scales. Made in Taiwan. 13 1/4" overall. 9" 1055 carbon steel blade. One piece construction with a black weather resistant finish. Lanyard hole. Made in Taiwan. 8 1/8" overall. 3 1/4" blade. One piece black Zytel construction with lanyard ring. Bulk packed. Made in Taiwan. 8 1/4" overall. 3 3/4" blade. Lanyard hole. From the Nightshade Series. Made from Grivory, the latest in fiberglass reinforced plastic. UV and heat stabilized, making them impervious to the elements. 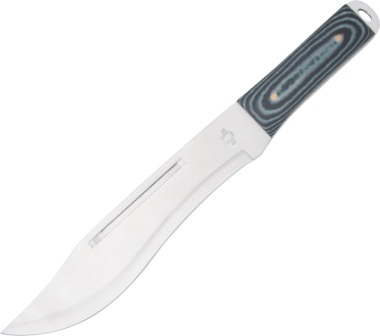 Deeply checkered Kraton handles have been molded directly to the tang. Extremely lightweight with an all black finish. Hang packaged. Made in Japan. Black Cor-Ex construction. For use with Tri Pack Throwers (CS80TGS). Bulk packed. Made in Taiwan. Black Concealex construction with neck chain. Hang packaged. Sheath only, Dart sold separately. Made in Taiwan. 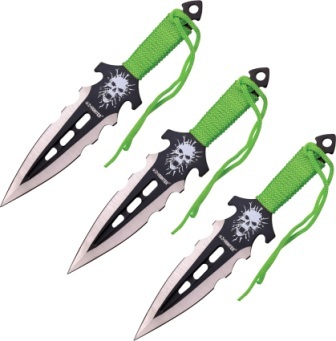 Set includes 3 throwing knives. Each knife measures 11 13/16" overall. 7 1/2" 1075 high carbon steel blade with black finish. Ballistic nylon sheath. Made in El Salvador. 12" overall. 2 1/2" sharpened double edge tip. One piece 1075 carbon steel construction with black epoxy powder coating. Handle has machined hole cutouts. Designed with the expert thrower in mind. Compliant with the rules of the International Knife Throwers Hall of Fame. Made in El Salvador. 14" overall. 3" sharpened double edge tip. One piece 1075 carbon steel construction with black epoxy powder coating. Handle has machined hole cutouts. Designed with the expert thrower in mind. Compliant with the rules of the International Knife Throwers Hall of Fame. Made in El Salvador. 10" overall. 7" blade. One-piece 1075 high carbon steel construction with black epoxy powder coating. Skeletonized handle. Three piece set. Black nylon belt sheath. Made in El Salvador. 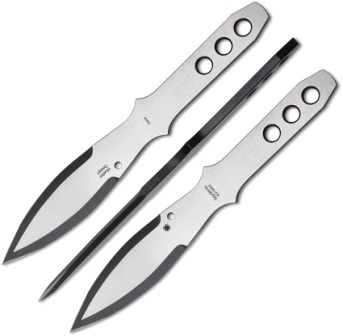 Includes two 12" overall throwing knives with a 6 3/4" bowie style blade. All 440C stainless construction. Full tang. Dual heat treatment - HRC 58-59 and HRC 45-46. Brown leather wrapped handle. Lanyard hole. Brown patterned leather belt sheath that holds both. 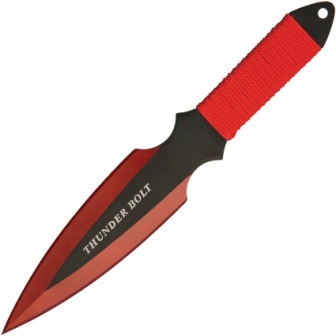 Can be used as a hunting or utility knife. Made in Taiwan. Overall: 8"; Blade: 3.5" l Stainless l Standard Edge l Black Stonewash Finish; Handle: Stainless; Other Info: Lanyard Hole l Thumb Ridge. Three piece set. One piece construction with cutouts. Black nylon belt sheath holds all. Boxed. Made in China. Blade: Stainless l Standard Edge l Black Finish; Other Info: 25" overall machete with 17.5" blade. Green ABS handles. Full, extended tang with lanyard hole. 10" overall bowie with 5" blade. One piece stainless construction with cord wrapped handle. 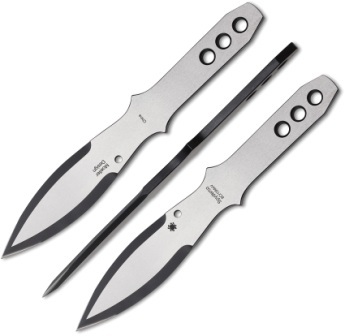 Two 7.5" overall throwing knives with 3" blade. One piece stainless construction with cord wrapped handle. Black nylon belt sheath with shoulder strap holds all. Boxed. Made in China. Includes three GH-2003 in a sheath designed to hold them all. Each knife is 8 5/8" overall with 4 5/8" blade which is 3/16" thick. 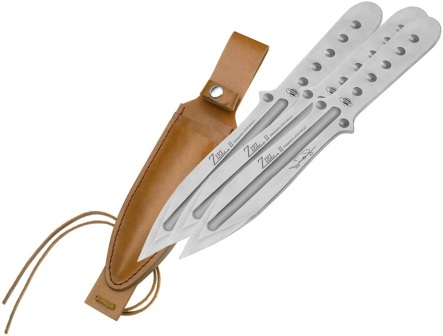 Designed by Gil Hibben, Master Knife maker. 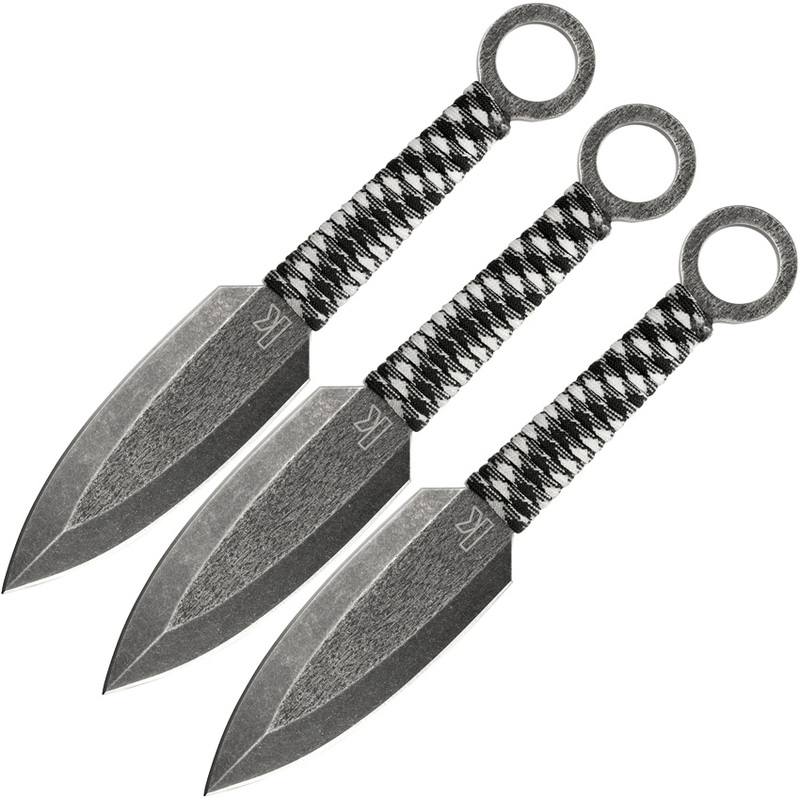 These are updated designs of the original Hibben Throwers. Constructed of one-piece, tempered stainless steel. They feature ergonomic handle designs that guide the hand into the same consistent and accurate release each time they are thrown. 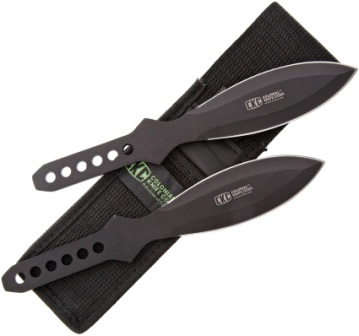 Each comes with black nylon belt sheath with reinforced liner and color Hibben Knives patch. Made in Taiwan. 12.13" overall. 6.5" blade. One piece satin finish 2Cr13 stainless construction. Includes 18" x 18" paper competition target. Brown leather belt sheath. Boxed. Made in Taiwan. 8 1/2" overall. One piece 420 stainless construction. Genuine leather sheath holds all three knives. Made in China. 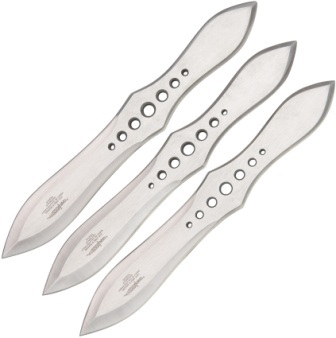 Includes three 8 1/2" overall throwing knives with 4 1/8" blade. One piece 420 J2 stainless construction. Handles have four holes. Triple pocket leather sheath. Made in Taiwan. Overall: 7"; Blade: 3.625" l Stainless l Standard Edge l Satin Finish; Handle: Stainless; Other Info: Lanyard Hole. Tanto blade. Brown leather belt sheath holds all. Target included. Boxed. Made in China. 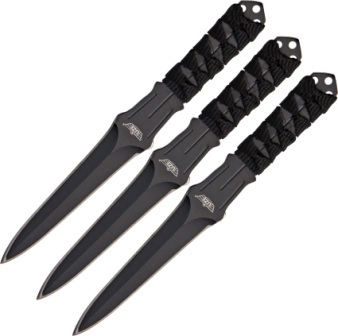 Includes three 11 1/4" overall knives with 6 1/4" tanto blade. One piece stainless construction. Leather belt sheath holds all three. Target included. Made in China. 11" overall. 6" blade. 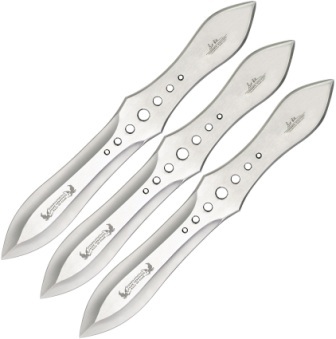 Knives are one piece AUS-6 stainless construction. Handles have machined hole cutouts. Black nylon belt sheath. Includes paper target. Made in China. 7" overall. 3 5/8" blade. 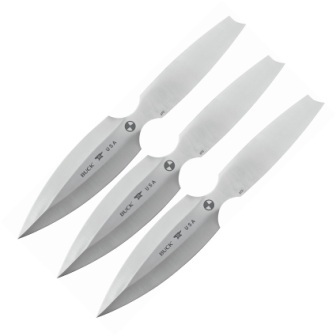 Knives are one piece AUS-6 stainless construction. Handles have machined hole cutouts. Black nylon belt sheath. Includes paper target. Made in China. Four pieces. As seen in The Expendables 3 movie. 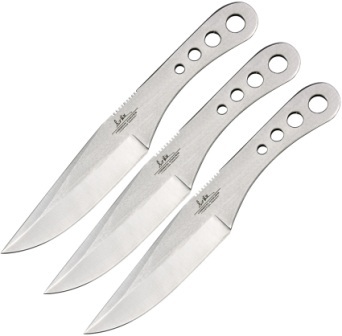 Each knife has one-piece stainless construction with sharpened edge and piercing point. Two 8 5/8" throwers feature cord-wrapped handles with lanyard hole. Two 10 1/8" throwers have uncovered, ergonomically machined handles with dual lanyard holes. Blades feature autographed laser etchings. 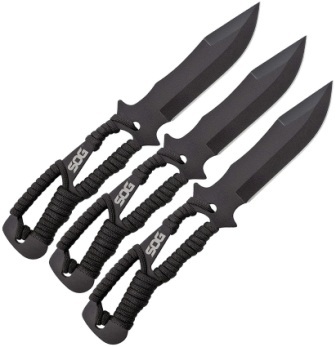 Black nylon sheath holds all four. Made in China. 11" overall. 6" satin finish 3Cr13 stainless blade. One-piece construction. Lanyard hole. 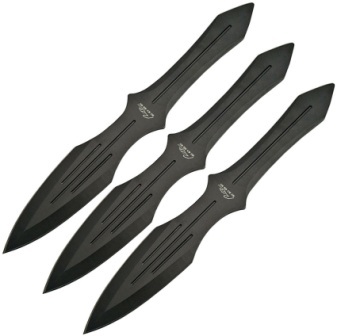 Set of three throwing knives. Black nylon belt sheath. Boxed. Made in China. 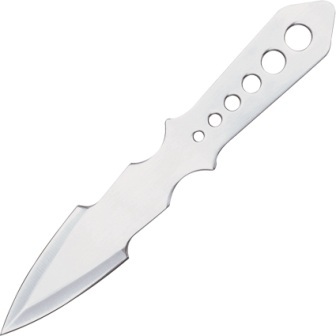 Overall: 10.75"; Blade: 6"l Stainless l Brushed Finish; Handle: Stainless; Other Info: Lanyard Hole. One piece balanced and tempered stainless construction. Unsharpened blade. Boxed. Made in Russia. Overall: 11.5"; Blade: 6"l Stainless l Brushed Finish; Handle: Stainless; Other Info: Lanyard Hole. Unsharpened double edge blade. One piece balanced and tempered stainless construction. Boxed. Made in Russia. Overall: 9.375"; Blade: 5.25"l Stainless l Brushed Finish; Handle: Stainless; Other Info: Lanyard Hole. One piece balanced and tempered stainless construction. Unsharpened blade. Boxed. Made in Russia. 10.5" overall. 6.5" blade. Lanyard hole. One piece brushed finish 420 stainless construction. Weight: 12.5oz. 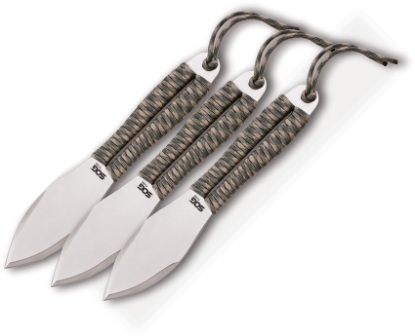 Designed by Russian Throwing Knife Instructor, Grandmaster V.S. Kovrov. Boxed. Made in Russia. Overall: 8.5"; Blade: 4.25"l Stainless l Brushed Finish; Handle: Stainless; Other Info: Lanyard Hole. One piece balanced and tempered stainless construction. Unsharpened blade. Boxed. Made in Russia. Overall: 9.5"; Blade: 5.25"l Stainless l Brushed Finish; Handle: Stainless; Other Info: Lanyard Hole. One piece balanced and tempered stainless construction. Unsharpened blade. Boxed. Made in Russia. 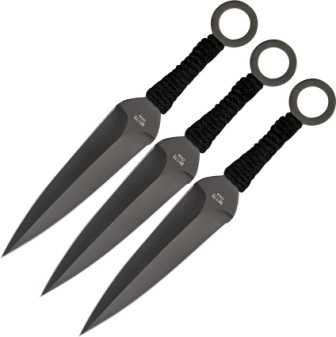 Includes three 9" overall throwing knives with 4 1/2" black-oxide BlackWash finish 2Cr13 stainless double-edged spear point blade. Full tang. Black and white paracord wrapped handle with oversized ring pommel. Black nylon belt sheath holds all three. Hang packaged. Made in China. Three Piece Set. 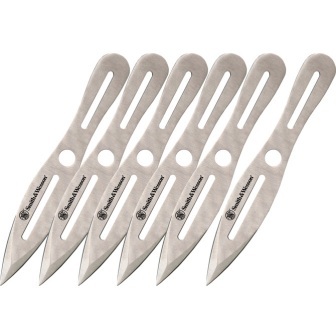 Knives are one-piece matte finish stainless construction with machined cutouts. 9" overall. 5" double edge blade. Black nylon belt sheath. Made in China. Each knife is 9" overall. 4" double edge blade with center slot cutout. Spider etching. One piece black finish stainless construction. Skeletonized handle. Lanyard hole. Black nylon belt sheath. Made in China. 9" overall. 5" two-tone finish double edge stainless blade. Green cord wrapped handle. Lanyard hole. Two piece set. Black nylon belt sheath. Boxed. Made in China. 9" overall. 5" two-tone finish double edge stainless blade. Red cord wrapped handle. Lanyard hole. Full tang. Two piece set. Black nylon belt sheath. Boxed. Made in China. Each knife is one piece black finish stainless construction with finger ring. 9" overall. 5" double edge blade. Black cord wrapped handle. Black nylon belt sheath. Made in China. 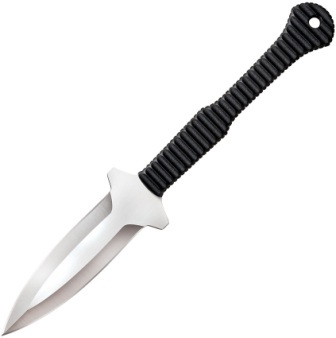 Knives are 6 1/2" overall with 3 1/4" double edge dagger blade. One piece black finish stainless construction with ring pommel. Black cord wrapped handle. Black nylon belt sheath. Made in China. 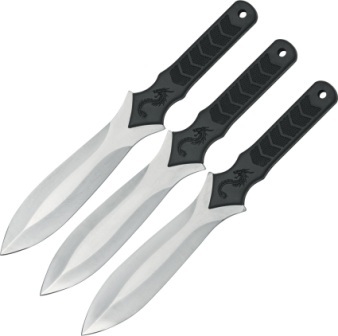 Includes three 8" overall throwing knives. 4" two tone black and matte finish stainless double edge blade. Black finish stainless handle with red skull artwork and ring pommel. 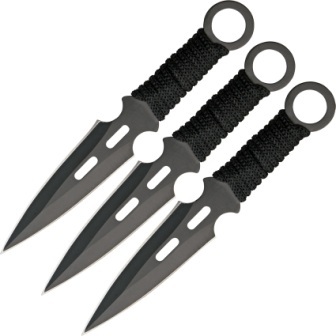 Black nylon belt sheath holds all three. Made in China. 9" overall. 5" black finish double edge stainless blade. Green cord wrapped handle. Full tang. 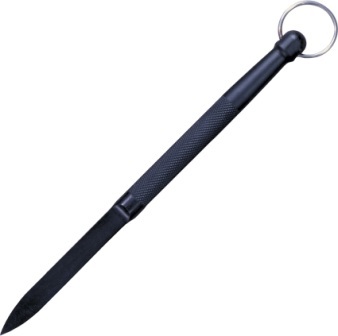 Black nylon belt sheath. Clam packed. Made in China. Each knife is 5 7/8" overall. 1 5/8" double edge blade. One piece steel construction with black coating and adjustable weight balance. 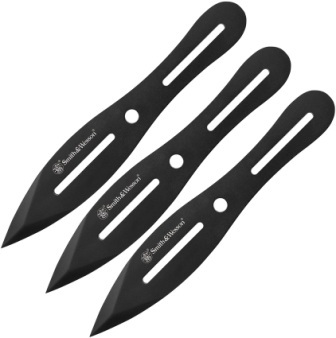 Black cordura sheath holds all three knives. Made in China. 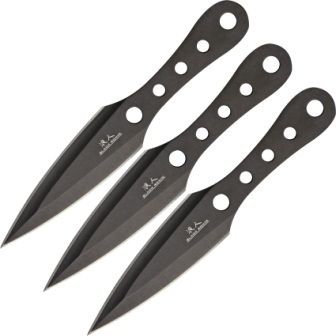 Knives are one-piece black finish stainless construction with slot cutouts. 6 1/2" overall. 2 1/2" double edge blade. 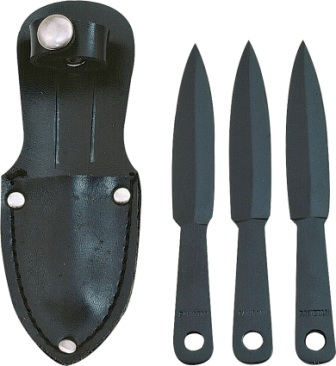 Black nylon belt sheath holds all three knives. Made in China. 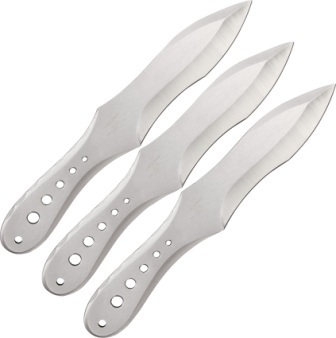 Knives are 7 1/4" overall with 4" double edge blade. One-piece two-tone brushed and black finish stainless construction. Lanyard hole. Black nylon belt sheath. Made in China. Three piece set. 10.5" overall. 6" blade. One piece Blackstone coated 420J2 stainless construction. One each clip, spear, and tanto blades. Lanyard hole. Black nylon belt sheath. Clam packed. Made in China. 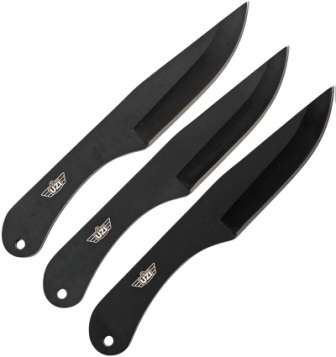 Includes three 4 1/2" overall black finish knives. 2 1/2" high carbon steel double edged blade. Black imitation leather belt sheath holds all three. Made in Pakistan. 8 3/4" overall. 4 1/2" blade. One piece all stainless construction. Black nylon belt sheath. Made in Pakistan. 8 3/4" overall. One piece all stainless construction with black finish. Drilled hole design handle. Black nylon belt sheath. Made in Pakistan. 10 3/8" overall. 5 1/2" blade. One piece all stainless construction. Black nylon belt sheath. Made in Pakistan. Overall: 10.5"; Blade: Stainless - Standard Edge - Black Finish; Handle: Black; Other Info: 1.25" sharpened tip. One piece black stainless construction. Black nylon belt sheath. Boxed. Made in China. 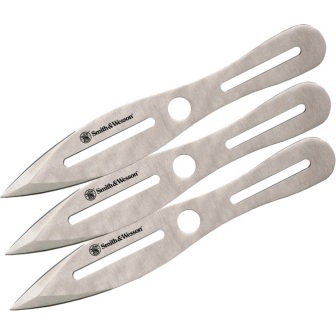 Contains three 5" overall knives with 2 1/2" double edged blades. All stainless construction. Black nylon belt sheath holds all three. Made in Pakistan. 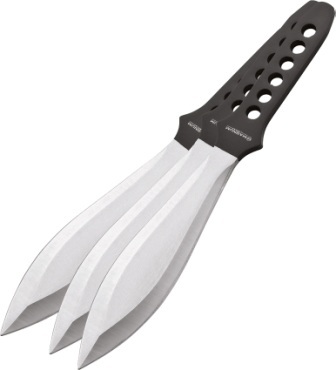 Contains two 7" overall knives with a 3 1/2" double edged blade. One piece all stainless construction. Black nylon belt sheath. Made in Pakistan. 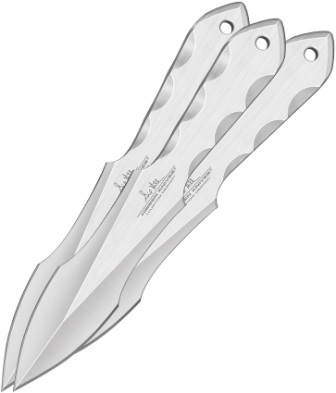 Contains three 6" overall throwing knives with 3" blades. One piece stainless construction. Black nylon belt sheath. Made in Pakistan. 6 3/8" overall. 3 1/4" double edge dagger style blade. One piece black coated stainless construction. Black cord wrapped handle. Lanyard hole. Black nylon storage case with velcro closure. Made in Pakistan. 12" overall. 8 1/4" stainless double edge blade. Full tang. Black micarta handles. lanyard loop. Made in China. 14" overall. 9 1/4" stainless blade. Full tang. Black micarta handles. Lanyard loop. Made in China. Set of three. Knives measure 10" overall with 5 1/4" blades. One piece stonewashed finish 3Cr13 stainless construction. Black nylon belt sheath holds all. Made in China. 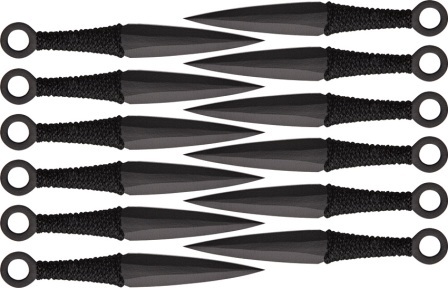 Includes six 7 1/2" overall throwing knives with 4 1/4" black finish 420 stainless double edge spear blade. Top portion of blade features white skull artwork. Black molded ABS handles with skull pommel. 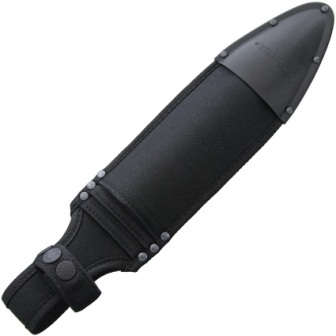 Black nylon leg and arm carry sheath holds all six. Front and back of knife shown. Made in China. Overall: 14.5"; Blade: 6.5" | 2Cr13 Stainless | Partially Serrated Edge | Black Finish; Handle: Black; Other Info: Double edge blade. Can be used as a spear. Milled hollow aluminum handle holds survival kit with adhesive bandages, matches, needle/thread, scalpel, tweezers, pencil, fishing line, hooks, leaders, and safety pin Handle cap has piercing tip and integrated compass. Black nylon belt sheath. Boxed. Made in China. Includes three 13 5/8" overall throwing knives with 8 7/8" blade. One piece 420 J2 stainless construction with leather handles. Black nylon belt sheath holds all three knives. Made in China. 10" overall. 5 3/4" blade. Black stonewash finish 2Cr13 stainless construction. Lanyard hole. Black nylon belt sheath holds all. Includes three paper targets. Hang packaged. Made in China. 8" overall. 4 1/2" blade. Black stonewash finish 2Cr13 stainless construction. Lanyard hole. Black nylon belt sheath holds all. Includes three paper targets. Hang packaged. Made in China. Spyderthrowers. 11" overall. Set of three. One piece precision machined 8Cr13MoV stainless construction with a two-tone black oxide and satin finish. Leather sheath. Boxed. Made in China. Spyderthrowers. 10" overall. Set of three. One piece precision machined 8Cr13MoV stainless construction with a two-tone black oxide and satin finish. Leather sheath. Boxed. Made in China. 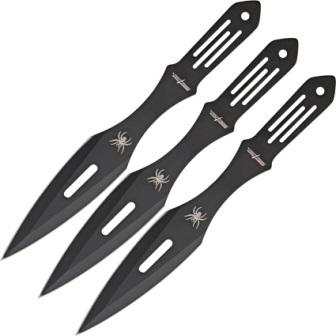 Spyderthrowers. 9" overall. Set of three. One piece precision machined 8Cr13MoV stainless construction with a two-tone black oxide and satin finish. Leather sheath. Boxed. Made in China. 8.75" overall. 4.25" satin finish double edge 420 stainless blade. One-piece construction. Lanyard hole. Set of three. Black nylon belt sheath. Boxed. Made in China. 7 1/4" overall. 4 1/4" polished stainless blade with 1 1/2" sharpened double edge end. Full tang. Black composition handle with brass rivets. Black leather belt sheath. Made in England. Description Coming Soon. Made in China. 12" overall. 7" satin finish double edge 8Cr13MoV stainless blade. Black textured G10 handle. Full, extended tang. Lanyard hole. Black nylon sheath. Boxed. Made in China. 9" overall. 2.5" double edge blade. Finger ring. One piece black finish 440 stainless construction. Black nylon neck sheath. Boxed. Made in China. 9" overall. 2.25" double edge blade. Finger ring. One piece satin finish stainless construction. Black Kydex neck sheath. Boxed. Made in China. 7.25" overall. 3" 3Cr13 stainless blade. One-piece construction. Finger ring. Lanyard hole. 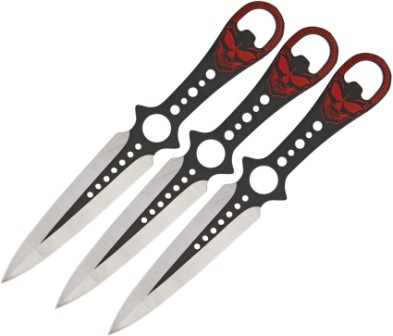 Includes three red and three blue throwing knives. Also comes with 8" diameter wood target board. Black nylon sheath. Clam packed. Made in China. 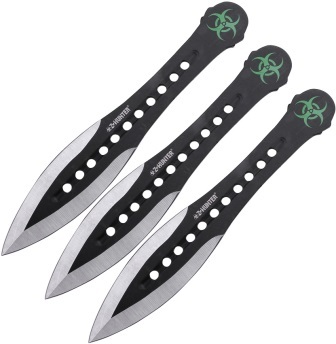 Includes three 10" overall throwing knives with sharpened tip. One piece 2Cr13 stainless construction with drilled hole and slot design. Embroidered black nylon belt sheath holds both. Hang packaged. Made in China. 8" overall. 4.25" black finish 2Cr13 stainless spear point blade. Black 2Cr13 stainless handle. One piece construction. Black nylon belt sheath. Clam packed. Made in China. 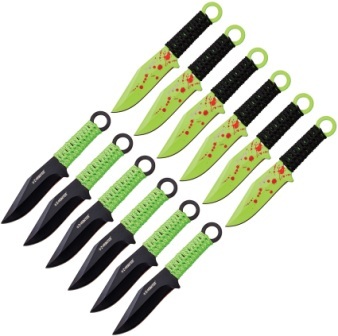 Includes six 8" overall throwing knives with sharpened tip. One piece 2Cr13 stainless construction with drilled hole and slot design. Embroidered black nylon belt sheath holds all. Hang packaged. Made in China. 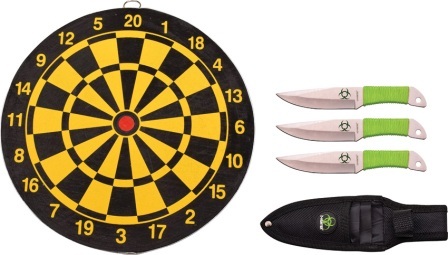 Game Set includes two 9" overall throwing knives with 3 7/8" clip point blades. One piece Turtleflage camo coated 420 stainless construction. Lanyard hole. Green "Turtleman" and turtle embossed black nylon belt sheath with protective inserts that holds both knives. 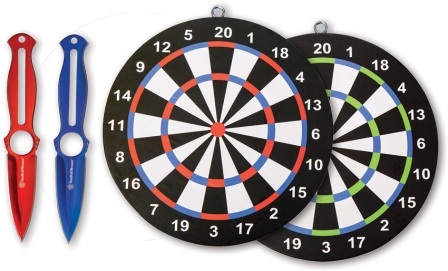 Includes six paper target games including The Game of '9', 300 Mega Game, Standard Practice Target, Pick Your Shot, Turtle Baseball and Turtle Drop. Made in China. 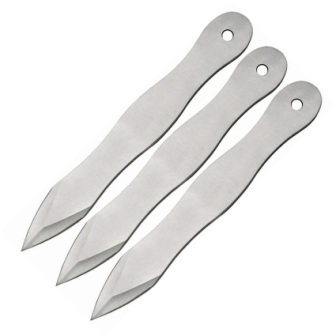 Each thrower is 7 1/4" overall with a 2 3/8" double edged blade. One piece 420 J2 stainless construction. Black impact resistant nylon sheath with shoulder harness. Sheath can also be worn on belt. Made in Taiwan. 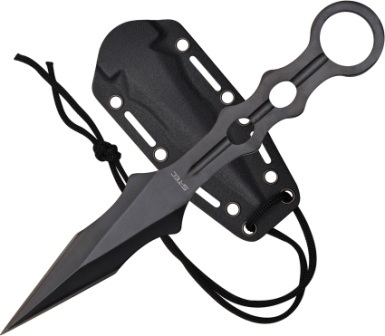 Features three perfectly balanced throwing knives constructed of a single piece of black anodized steel. 12" overall. 6 1/2" double-edged blade. Black cord wrapped handle with finger hole. Custom black nylon sheath with boot clip and leg strap for multiple carrying options. Officially licensed. Made in China. 6 1/2" overall. 3 1/2" double edge blade. Knives are one piece black finish stainless construction. Handles have machined hole cutouts. 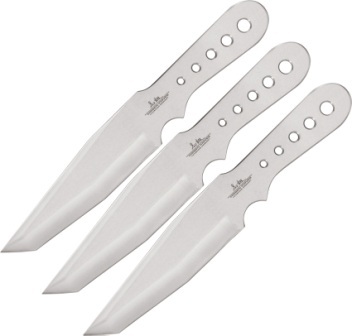 3 knife set. Black nylon belt sheath. Made in China. 5 5/8" overall. 2 1/4" double edge blade. One piece black finish stainless construction. Handles have machined hole cutouts. Molded black plastic multi-position sheath with shoulder harness. Made in China. 4" black finish double edge 3Cr13 stainless blade. Set of three. Black nylon belt sheath. Made in China. One knife is 6" overall with 3" blade and one knife is 8" overall with 4" blade. 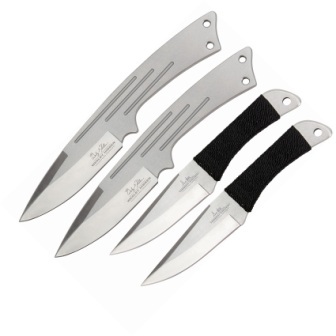 Knives are one-piece satin and black finish stainless construction with double edge blade. Black nylon belt sheath holds both. Hang packaged. Made in China. Knives are 6" overall. 3" double edge dagger blade. One-piece black finish stainless construction. Lanyard hole. Black cord wrapped handle. Black nylon belt sheath. Hang packaged. Made in China. 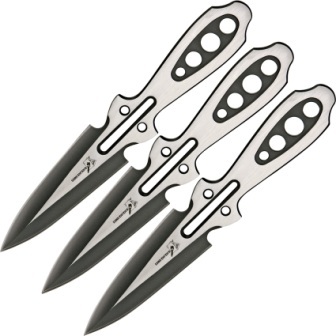 Includes three 8 1/4" overall throwing knives with 4" blades. One piece black stainless construction with lanyard hole. Embossed brown leather belt sheath holds all. Hang packaged. Made in China. 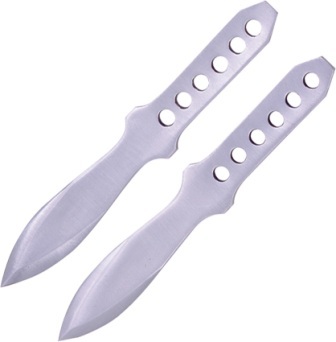 Includes three 6 1/4" overall throwing knives with 2 1/4" double edged blades with fuller groove. One piece stainless construction with lanyard holes and tied with a red silk ribbon. 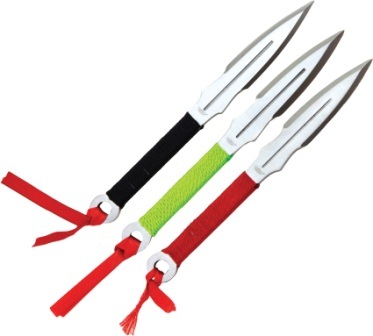 Each knife handle is wrapped in red, green or black nylon thread. Black nylon belt sheath holds all. Hang packaged. Made in China. 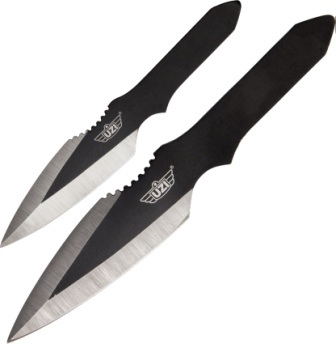 Includes two 8" overall throwing knives with 3 1/2" two-tone black finish double edge blade. Full tang. Black finish stainless handle with machined hole cutouts. Balanced for accurate throwing. Black nylon belt sheath. Hang packaged. Made in China. 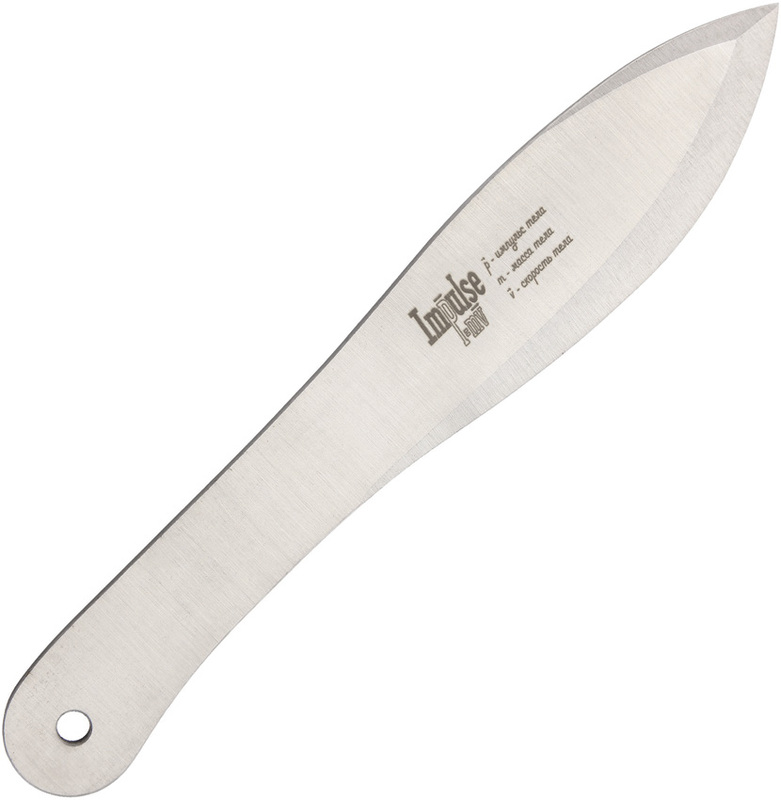 Includes two 8 1/4" overall knives with 4 1/4" blade. Stainless construction with 1" ring pommel. Made in Pakistan. 9" overall. 4.75" blade. Black cord wrapped handle. Lanyard hole. Set of four. 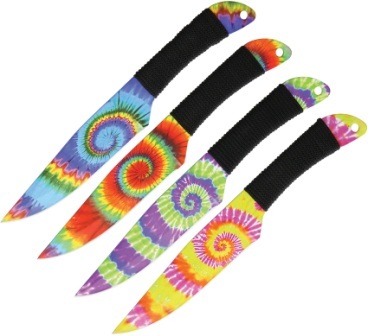 One piece tie dye finish stainless construction. Black nylon belt sheath. Boxed. Made in China. Knives are one piece two tone black and satin finish. 6" overall. 3 1/4" double edge blade. 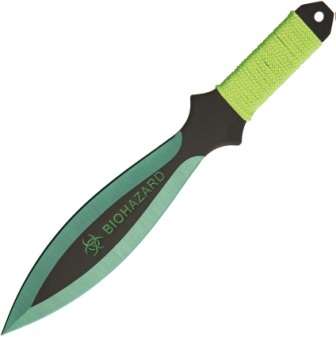 Skeletonized handle with green bio-hazard logo. Black nylon belt sheath. Comes with 14 3/8" diameter cork board target with green and red Zombie, bio-hazard, and spatter artwork. Made in China. 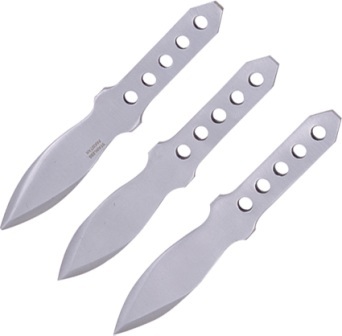 Includes three 6 7/8" overall throwing knives with 3" double edged blades. One piece black finish stainless construction. Full tang. Skeletonized handles with guard. Lanyard hole. Black nylon belt sheath with rubber patch logo holds all. Made in China. 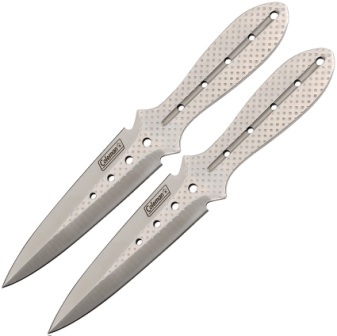 Includes three 9" overall throwing knives with double edged dagger style blades with slot cutout. One piece black finish stainless construction. Full tang. Contoured handles with slot cutouts. Black nylon belt sheath holds all. Also includes a 14 5/8" overall target board with zombie and red splatter design. Hardware included. Hang packaged. Made in China. 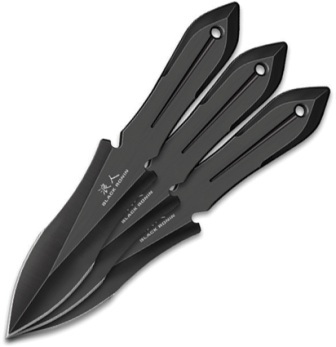 Includes three 7 1/2" overall throwing knives with 4 1/4" black finish double edge blade with slot cutouts. One-piece stainless construction with integrated guard and lanyard hole. Handle has lime green cord trim. Black nylon belt sheath holds all. Made in China. 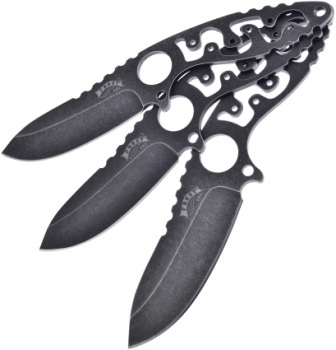 Contains three 8" overall two-tone black and matte finish stainless throwing knives. Full tang. Oversized lanyard hole. Each knife has different skull artwork. Made in China. 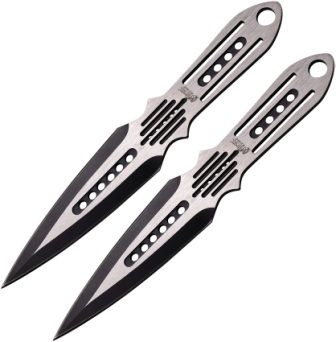 Includes three 7 1/2" overall throwing knives with 4" two-tone black and matte finish stainless double edge blade. Top portion of blade features white zombie head artwork. Full, extended tang with pointed pommel and lanyard hole. Neon green cord wrapped handle. Neon green cord lanyard. Black nylon belt sheath holds all. Made in China. 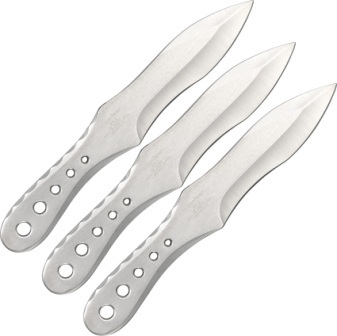 Includes three 6 1/2" overall throwing knives with 3 1/4" blade. One piece stainless construction with green biohazard logo. Neon green cord wrapped handles. Lanyard hole. Black nylon belt sheath holds all three. Comes with 9" diameter target board. Made in China. 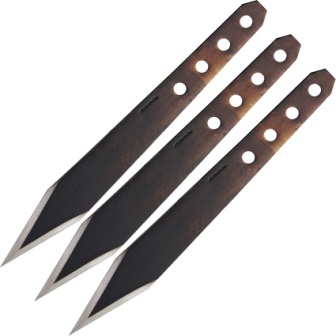 Includes three 6 1/2" overall throwing knives with 3 1/4" double edged blade. One piece two tone black and silver finish stainless construction with finger ring and green biohazard logo. Neon green cord wrapped handles. Black nylon belt sheath holds all three. Comes with 9" diameter target board. Made in China. 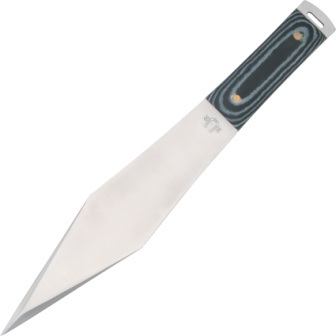 Knives are one piece 440 stainless two-tone black and satin finish. 7 1/2" overall. 3 3/8" double edge blade. 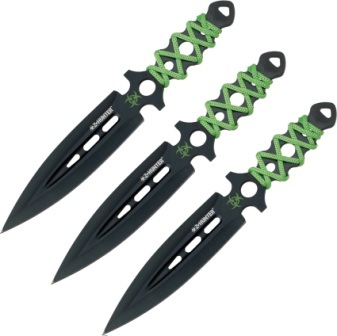 Black finish handle with machined hole cutouts and green biohazard artwork. Black nylon belt sheath holds all. Made in China. Six piece set. 6" overall with 3" double edge blade. 440 stainless one piece construction. 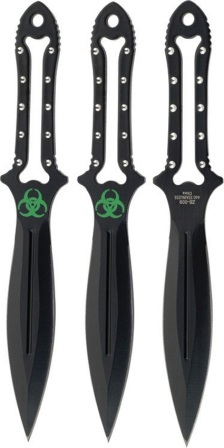 Three black painted handles with green biohazard artwork and three green painted handles with black biohazard artwork. Black nylon belt sheath holds all. Made in China. Knives are 6" overall with 3" blade. One piece 440 stainless construction with ring pommel end. Six black finish with green paracord wrapped handle and six green painted with red paint splatter and black paracord wrapped handle. Black nylon zippered storage pouch holds all. Made in China.